ZIMBABWE – Political infighting and a collapsed economy offer little light at the end of tunnel for the majority of Zimbabweans, writes Piers Pigou. There is no end in sight to the hardships faced by the majority of Zimbabweans. Political uncertainty and economic insecurity have worsened as the country struggles to develop the necessary foundation to underwrite a broad-based and sustainable recovery. There was hope in 2013 that Zimbabwe was turning a corner. Elections that year should have provided a platform of legitimacy for the ruling Zanu-PF party and the country to build on the fragile confidence developed through the power-sharing period of the Global Political Agreement (GPA) between 2008 and 2013. Thirty months later, the failures of governance in the ruling Zanu-PF party are palpable. Upbeat projections have proved to be mostly predicated on government rhetoric about new policy commitments and belief in the country’s potential. The Southern Africa Development Community has withdrawn its mediation efforts. No replacement framework has emerged for stability, economic recovery or alignment of laws with the constitution and implementation of the rule of law. Only 700 000 people among a population of 13 million have formal jobs, less than at independence in 1980. Ninety percent of jobs reside in the informal sector, where reliance on diaspora remittances remain crucial. Conditions are likely to deteriorate further due to insolvency, drought and growing food insecurity, and the exigencies of its venal political culture. Zimbabwe needs improved access to capital to help the economy grow. Harare reneged on debt repayments to international financial institutions (IFIs) in the early 2000s, triggering a 15-year-long struggle for funds. Alternatives have proved hard to find. The country’s “Look East” policy opened important new avenues of investment, especially from China, but this is no panacea. Zimbabwe’s hopes for a major loan on easy terms from Algeria have been dashed by the oil price collapse, which has forced the introduction of austerity measures in that country. In the power-sharing area before 2013, a slow dance of promised reform was accompanied by incremental re-engagement with Western countries. The adoption of a new constitution was a laudable achievement, but unsurprisingly violation and selective application of the law has continued. Since 2013, specific attention has focused on addressing the huge foreign debt. In October 2015, IFIs accepted a plan to clear $1.8 billion in arrears by May 2016. This now looks increasingly unrealistic. Harare has only partially implemented the plan’s fiscal policy conditions, like a sizeable reduction in the public wage bill that now accounts for over 80 percent of government expenditure. The plan also only aims to deal with outstanding debt arrears. Obtaining new credit will require more significant and politically sensitive reforms, for which there is limited appetite ahead of elections in 2018. US law requires American delegates in the IFIs to vote against Zimbabwe accessing new lines of credit if there are not significant improvements around “respect for ownership and title of property, freedom of speech, an end to lawlessness, violence and intimidation sponsored, condoned or tolerated by the government of Zimbabwe, the ruling party, and their supporters or entities”. Zimbabwe must also have held a presidential election that is “widely accepted as free and fair”. Progress in nearly all these areas has been marginal. As with many liberation movements in the region, Zanu-PF will not countenance public debate on succession, and instead promotes a fiction that ailing 92-year-old President Robert Mugabe will be their presidential campaigner in 2018. Public promises by his controversial wife, Grace, to wheel him into work even if he can no longer walk fuel speculation that he will remain in office until he can no longer function. This feeds growing levels of political uncertainty and insecurity, both in the back rooms of Zanu-PF and outside. Political opposition remains fractured, and prospects of convergence unlikely ahead of the 2018 elections. The People First party, launched this week by former vice-president Joice Mujuru, will have to prove it can organise on the ground to have any real impact. Vital reforms of abusive electoral practices and the institutions controlling them are also unlikely, increasing the likelihood of a disputed election in 2018. Zanu-PF is fractured, but incumbency and its institutional dominance make it the country’s most powerful political entity. Mujuru’s defection triggered a purge of any leadership elements associated with her. 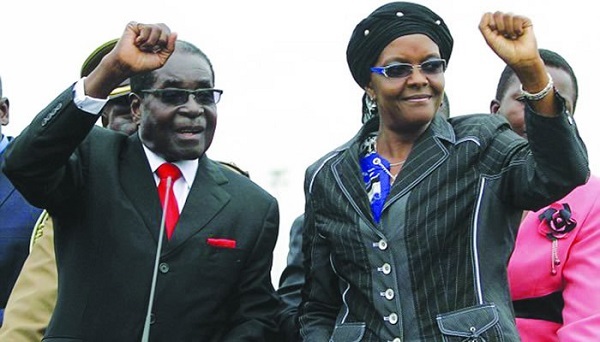 Fluid fault-lines pit supporters of Mujuru’s newly elevated rival, Vice-President Emmerson Mnangagwa, against an assorted mix of Zanu-PF leaders (often referred to as Generation 40 or G40), who have lined up behind an increasingly ambitious and influential Grace Mugabe. Her public interventions appear to have the support of her husband, including attacks on elements of the security sector and war veterans that raise fears of open conflict. As the struggle over the Mugabe succession heats up, it is perhaps unsurprising there is little prospect of reform. The politics of fear predominate, suffocating hopes of new initiatives. Mugabe’s eventual exit will certainly shift the political calculus, but is not a panacea for recovery; in fact, without a consensus on how to choose a successor, it may well aggravate insecurity. If Zimbabwe is to move beyond its current stasis, and regain the trust of donors, private investors and ordinary citizens, the government must become more accountable, initiate electoral reform, end human rights and rule-of-law violations and articulate a coherent vision. Above all, Harare’s rulers must “walk the talk” of reform with actions that go beyond personal, factional and party aggrandisement. * Pigou is the Southern Africa consulting analyst at the International Crisis Group, an independent conflict-prevention organisation.